Having survived the same extermination campaigns that eliminated wolves from the park between 1910 and 1930, coyotes have by default become the predominant canine predator. The restoration of the wolf in Yellowstone has changed this status. Although the coyotes fur varies in color, the majority of adults have grizzled grey coats with a white underbelly, bushy tail, and reddish hair on their legs. On average, coyotes weigh between 30 and 40 pounds, about half that of a wolf. Compared to the wolf, coyotes are dainty, with their heads, muzzles, legs and feet far less massive than a wolf’s. 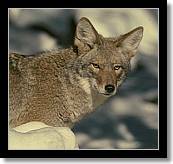 Coyotes roam throughout the Yellowstone region and can be seen most anyplace in the park. 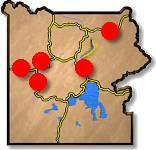 Areas where they are most visable are along the Madison, Firehole and Gibbon rivers. Lamar Valley is a good place but the introduction of the wolf has displaced many in that area. Hayden Valley is another good spot.